"A friend here in the States emailed me about your article and the P-80 writing that he didn't know Monogram ever did that model. told him that they only did 17 kits up to the P-47 and that all the rest on my list are my own designs using the same techniques pioneered by Monogram. I've tried to select subjects that I thought Monogram would have eventually done had they not abandoned the Speedee Bilts in 1964 in favour of all plastic injection molded kits. I'm sure they did this because of economic reasons. It's my understanding that the plastic accessories in the original Speedee-Bilts were moulded by another company in Chicago, and eventually Monogram decided to invest in the equipment to do the moulding in-house. Many of us modellers mourned the passing of the Speedees, and over the years a number of folks tried to get Monogram to re-introduce the kits. But the answer was always that the costs and demand were just not there to make it economical. I think Ron has done a fantastic job with his replicas ... I'm now having to resist the temptation to buy the F-86 Sabre and the MiG-15. Above: Ron's replica Monogram Speedee-Bilt jets. 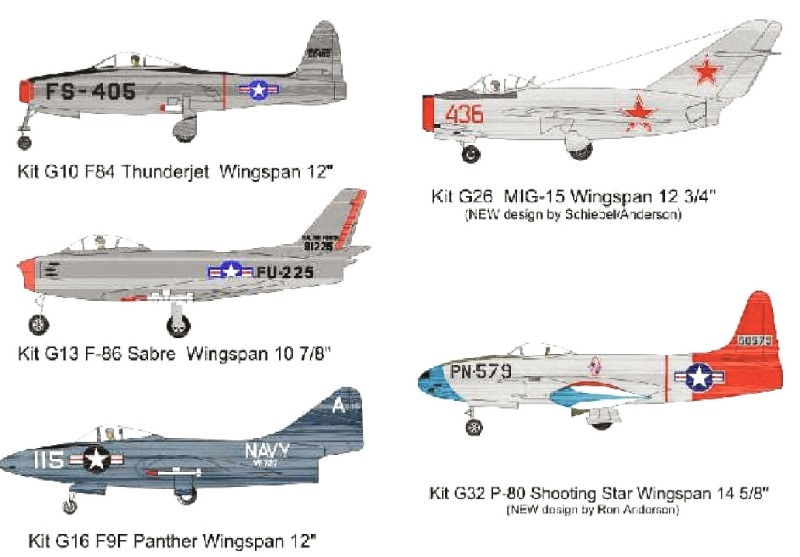 The MiG 15,and P.80 Shooting Star are Ron's designs; the others are replicas of original 1950's kits. I'm sure the Panther could be turned into a Cougar. I did an Internet search to see what kits for the 'Cougar' were out there. This was a mistake. Probably best to wait and see if I can get the P.80 to fly. It will probably need something like an L-2HP to get it motoring. These are, alas in short supply at the moment - I'm hoping Dr Z will be visiting us with fresh supplies soon. Meanwhile, I'll check what motors we do have.